Changing Torrent Software Settings like uTorrent or BitTorrent, you change the amount of Bandwidth. Set to the smallest number so that the remaining bandwidth can be fully allocated for the download process. The trick is to right-click the file that is being downloaded and select Bandwidth Allocation> Set Upload Limit and Select the Smallest Number. The next setting is to convert Bandwidth to High to become a Priority. How to Right-click on the file you are downloading and select Bandwidth Allocation> High. It is an option to set bandwidth allocation so that the file you want will get high priority in the download process. Next is to set Global Maximum Number, how to go to Options> Preference> Bandwidth. On the menu there is a feature that is used to set how many connections can be provided. Change the value to 200. 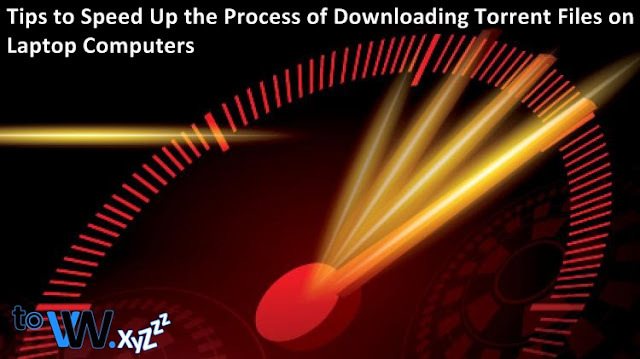 Downlaid speed of many files with one is very influential, because to download one file faster than downloading files simultaneously in large quantities. You can go to the Options Menu> Preferences> Queue and set the Maximum number of active downloads to number 1. This will make you only be able to download one file at a time so it is more stable and fast. That's a tip to speed up downloading Torrent files easily on a laptop PC, hopefully it's useful. Thank you for visiting the ToveweXYZ Website.